You’ve probably heard of the Chromecast by now. It’s an inexpensive USB dongle the size of a flash drive that plugs into a TV. We’ve already covered six unconventional ways of using the device that aren’t immediately obvious. We followed that up with a piece onstreaming local media to the Chromecast, functionality that is enabled out of the box but not exactly advertised. Both of these posts assume that you either have or want a Chromecast. First, head over to the Play Store and download CheapCast. It’s a free app, so it already lives up to its name out of the box. The app should install just fine, even on devices that aren’t capable of utilizing it. Once it’s up and running, you will be greeted by a screen that looks like this. CheapCast may be performing a relatively complex task, but this is hidden from the user. The options displayed above are all there is to see, and none of them have to be toggled to start using the device. Just press the “Start Service” button to turn your device into a Chromecast. 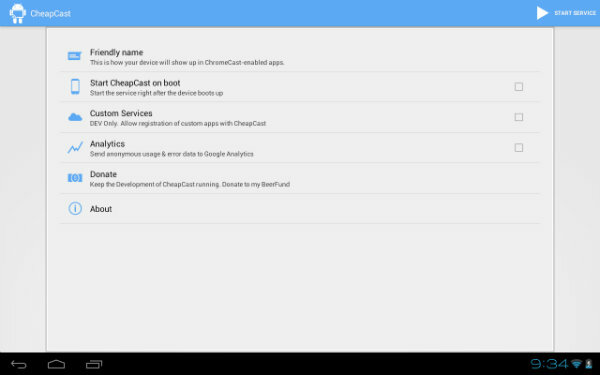 Now, when you return to whichever device you want to stream media from – whether that be a desktop, laptop, tablet, or smartphone – it should be able to detect your device running CheapCast in the list of Chromecasts on your network. Select it as you would any other, and the video or audio should start streaming to whichever TV or monitor your device is plugged into. 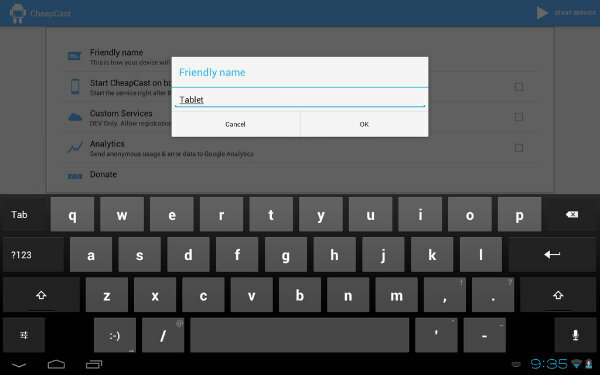 The top option, which reads “Friendly Name,” gives you the ability to rename your device to something that may be more recognizable. If your device is going to be stationary, you can name it after the room it’s in, making it easy to keep track with where you’re projecting your media. On the other hand, if your device is going to be mobile, it may help to name it accordingly. First things first, you will need an Android device that can output to HDMI. If you don’t have one, then the cost of getting your hands on such a tablet or handset could cost more than the price of the Chromecast itself. On the other hand, there are Android media sticks available out there that, while more expensive than a Chromecast, aren’t much larger and cost significantly less than a tablet or phone. 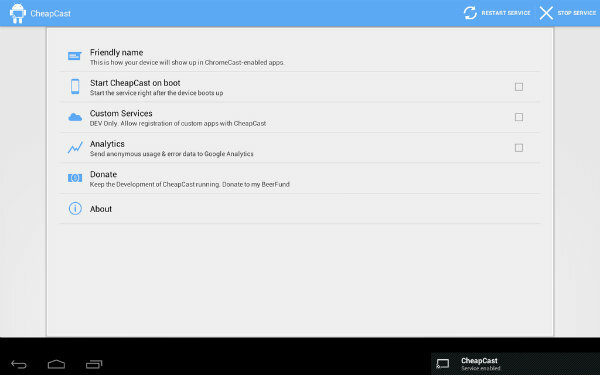 Either way, using CheapCast is going to require more effort than just buying a Chromecast, even if only marginally so. And without a decent amount of work, this solution probably won’t look as elegant. A Chromecast generally disappears behind the TV it’s plugged into in a way that a tablet won’t. Still, if you can get CheapCast up and running (and your mileage may vary depending on what device you’re trying to set up), it’s a great tool. It’s obviously aimed at tinkerers and more hands-on users who are already aware of the limitations of a solution like this and aren’t deterred. A Chromecast is a cheap and user-friendly media streaming experience. CheapCast replicates its behavior, but at the same time, it empowers you to create a media streaming solution of your own by relying on whatever hardware you see fit. Have fun, and feel free to share you experience with us in the comments below.